BOSTON ” When the Red Sox were done circling the bases, Fenway Park’s quaint green-and-white manual scoreboard told the tale of a World Series opener like no other: Boston 13, Colorado 1. And just like that, all the momentum that belonged to the Rockies vanished into New England’s drizzly autumn air. Only this wasn’t a lazy March afternoon in Tucson, Ariz., or Fort Myers, Fla. This was baseball’s biggest stage, a time for tension and drama. Instead, fans were treated to double after double pinging off the Green Monster and rolling up the gaps as if this were some PlayStation or Xbox version of the World Series instead of the real thing. 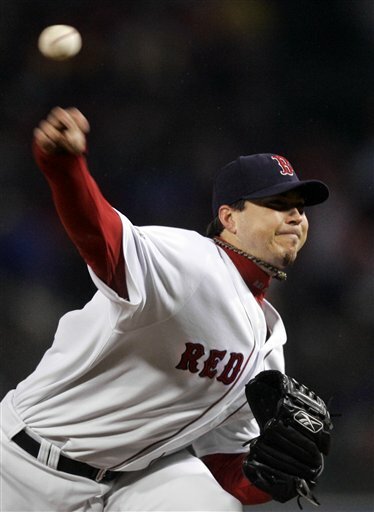 Josh Beckett pumped 97 mph fastballs by overwhelmed batters in the most overpowering start since Sandy Koufax. Dustin Pedroia yanked Jeff Francis’ second pitch over The Wall, only the second player to lead off the Series with a home run. Despite the lopsided score there was no boasting from Boston. When Boston last appeared in the Series, the Red Sox swept St. Louis for their first title in 86 years. Back with no Bambino’s curse to worry about, the Red Sox flattened the Rockies with ease. Boston set a record for runs and victory margin in an opener and finished with 17 hits, becoming the first club with eight doubles in a Series game since Pittsburgh in 1925. After taking a 6-1 lead against Colorado ace Jeff Francis, the Red Sox piled on seven runs in the fifth, when Rockies reliever Ryan Speier walked three straight batters with the bases loaded ” the first time that ever happened in the Series. Make no mistake, these Red Sox are slick, and not just because of an on-and-off drizzle that seemed to dampen the noise from 36,733 fans in Fenway Park. Counting their comeback from a 3-1 deficit against Cleveland in the AL championship series, the Red Sox have outscored opponents 43-6 in their last four games. In the first five innings against Colorado, the Red Sox were 11-for-15 (.733) when batting with two outs. Just four batters in and trailing by only a run, the Rockies moved their infield in. Manny Ramirez singled over Troy Tulowitzki ” who might have caught the ball had he been playing back at the normal shortstop position ” and J.D. Drew’s double made it 3-0. “That’s not the way we drew it up,” Rockies manager Clint Hurdle said. Boston showed the veteran attitude and stretched a Red Sox Series winning streak to five for the first time since 1915-16. While the Rockies lined up for the introductions on the foul side of the third-base line, looking every bit the World Series rookies they are, the Red Sox stood shoulder-to-shoulder on the infield side, knowing they belonged. With stubble on his upper lip and a hint of a soul patch on his chin, the 27-year-old Beckett pitched in the manner of a young Roger Clemens. Coming off his ALCS MVP, the 2003 World Series MVP blew away the Rockies with 95-97 mph fastballs the first time through the order, then started mixing in a 77 mph curve. Beckett allowed six hits in seven innings, struck out nine and walked one, improving to 4-0 with a 1.20 ERA in the postseason this year. “We’re not done and he’s not done,” Red Sox manager Terry Francona said. Pitching on 12 days’ rest, Francis was finished after four innings, giving up six runs and 10 hits. Colorado, which had matched the 1976 Cincinnati Big Red Machine by sweeping its first seven postseason games, lost for just the second time since Sept. 15. Boston tries to make it 2-0 Thursday night when Curt Schilling, 10-2 in postseason play, pitches against rookie Ubaldo Jimenez. The winner of the opener has gone on to win nine of the last 10 World Series. While the 1959 Chicago White Sox and 1996 Atlanta Braves both won their openers by 11 runs, they went on to lose the Series. Beckett began by fanning Willy Taveras, Kaz Matsui, Matt Holliday and Helton, becoming the first pitcher to strike out the first four batters in a Series game since Koufax got five Yankees to start the 1963 Series, according to the Elias Sports Bureau. And what a quintet those were: Tony Kubek, Bobby Richardson, Tom Tresh, Mickey Mantle and Roger Maris. With 64 postseason RBIs, Ramirez moved ahead of David Justice for second all-time behind Bernie Williams (80). … The 12 combined doubles were a Series record. … The 1932 New York Yankees and 1996 Braves scored 12 runs each in their openers. … The only other player to homer starting a Series was Baltimore’s Don Buford against Tom Seaver and the 1969 Miracle Mets.